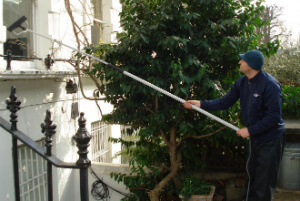 Industrial & Residential Window Cleaners Greenwich SE | Quality Property Care Ltd. Enjoy more than simply expert window cleanup, give Quality Property Care Ltd. a call and book the very best window cleaning in Greenwich SE at a reasonable price. Fully equipped and capable, we will leave no spots behind, taking away not only grease, but built up mud, grime, dirt, fine powder, mud, rain residue, fingerprints and a lot more. Dear customers, Quality Property Care Ltd. company completely assure you that your property is under security. The staff we send to you is composed of insured and well-trained window cleaners. They are motivated, devoted and diligent. You are not even required to stay in the home in the course of window cleaning in Greenwich SE. All you need to do is to leave us some parking space, so the friendly experts can park the van with the water fed pole product. In case of any omission, we cover the damages or re-do the procedure for free! Your final customer satisfaction is certain. For the cleaning Quality Property Care Ltd. professionals use plain water from the tap, it passes through a series of filters located inside the van, they strip the h2o from its miners and other chemical substances, leaving it pure. This pure water does not respond with the dirt on your window but strips it away gently and without harming neither the glass nor the sill or frames. It is ideal for the leaning of all window kinds, it does not leave a chaos aside from a puddle and it is odour free. To achieve our famous final results we apply a simple water-purification method which strips away normal tap water from its minerals. This leaves it a simple H2O molecule which is a lot lighter and sticks a lot more to dirt, grime and mud. The technique is a very effective way of cleaning away even the filthiest of window types of surface and can get through to up to 4 stories in height. 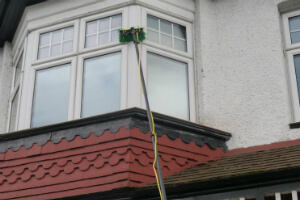 Using a telescopic water-fed pole we clean the window sills and windows from the bottom to top using only water, no detergents as detergent get even more dirt if not rinsed with water. In addition detergents may have corrosive properties on PVC surface types and cause the seals and gasket of the windows to rot and decay faster. The length of the water fed pole lets us to clean business buildings without having to use a ladder or ropes. Rope systems are offered for commercial clients, get in touch with us at 020 3746 4287 for more info. Just phone call 020 3746 4287 or send an online booking require, and our client care service will be back to you right now. You will get written confirmation for the booking. There is no deposit required, and you will pay for only after the service has been completed. The payment methods accepted are flexible. No hidden charges, and big deals for returning customers or for those ordering more than one service at a time.